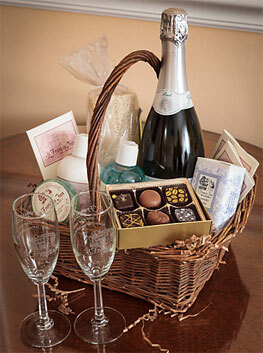 The perfect surprise for family and friends...have a special gift basket, flowers, or wine waiting in the room upon arrival. Pre-arrange for a private massage for yourself and your partner in your room. 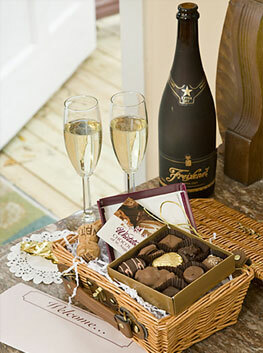 Or select a unique treat: a picnic for two, chocolate covered strawberries, or one of our many Ala Carte Extras. 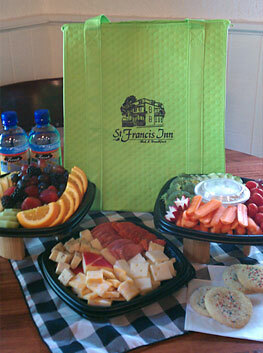 Pick and add these special Gift Baskets and Ala Carte Extras to make a stay at St. Francis Inn a true celebration. An elegant tray with breakfast for 2, including our hot homemade entrees and fresh fruit selection of the day, along with your choice of freshly baked bread, our 1791 Granola, cereals, Barnie's coffee, tea, juice, and a full serving of Inn hospitality. You can experience the ultimate in relaxation, stress reduction, pain relief, and wellness, with a massage in the privacy and convenience of your own room. Our licensed therapist, Kelly McCormack, will improve your circulation, loosen tight muscles and make you feel rejuvenated! See our Massage page for various options and pricing. 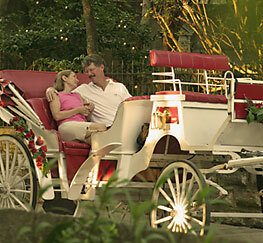 Board at the Inn and take a horse drawn carriage tour through the streets of the Old City. It's a wonderful way to see St. Augustine, narrated with colorful historic stories. 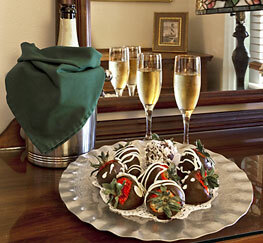 $115 includes carriage ride for up to 4 persons, tip to driver, pickup & dropoff at St. Francis Inn. This small cake serves 4-6. 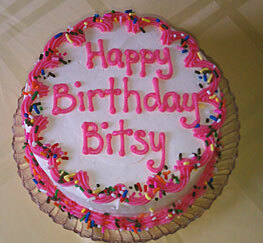 Choose chocolate, vanilla, lemon or strawberry cake, with chocolate or vanilla whipped frosting. Perfect for birthdays, anniversaries, or other special occasions. A special keepsake for a lasting memory of your visit to St. Augustine. 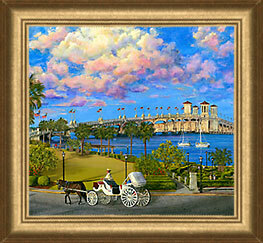 Limited edition prints of "Bayfront St. Augustine," a custom painting commissioned by the Innkeepers, are available for guests to purchase, framed and unframed. Have one waiting in your room as a surprise! Prices vary; see our Gift of Art page. In our Gift Center there are many fine keepsakes with the Inn's logo, such as plush monogrammed terry robes, shirts, mugs, vases, toasting glasses, canvas tote bags, ornaments and more. 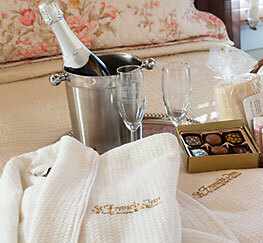 Choose a gift and we'll have it waiting as a surprise in your guest room. It will be a lasting memory of your visit. 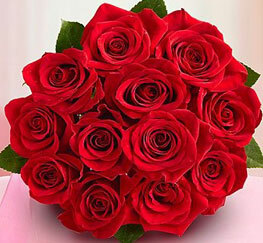 E-mail your special touches request to us now! Be sure to include your name as purchaser, the recipient, the occasion, the reservation date, the delivery date, any special message, the gift you selected, and your credit card information. 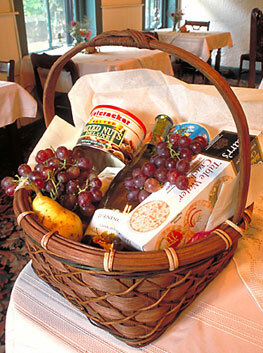 For baskets with wine, state your preference of Merlot or Chardonnay. Or just call us at 800-824-6062 and we can take care of it for you by phone.